For All group bookings, standard payment and cancellation policies do not apply. We need 100% advance in bank transfer at least 30 days before the group arrival. Stops is a pit-stop like none other for the spirited traveler. Stops is where you refuel and equip yourself along your journeys. It is a space where you get to meet fellow travelers, eager to discover places, cultures and stories. You can share, plan, guide and learn together while relaxing and having fun. 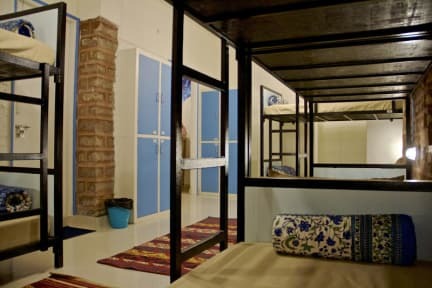 With professional and knowledgeable staff and several essential facilities available 24x7, the hostel becomes your home and the city becomes your own backyard. Stops is a space where you get to stay your way. Immerse yourself in the ever expanding book-exchange library, choose from the collection of many documentaries and films, hang out in the lovely balconies and common areas, cook together in a fully equipped kitchen or just chill and do nothing! It's your call. It is a space where you get to have good fun with like minded travelers - from the most social city walks ever to challenging early morning yoga sessions to never ending Bollywood movie nights and vibrant festival celebrations. This hostel has amazing ambience and the staff is amazing as well. This is a well known chain of hostels and I also stayed in one GoStop in Agra and had the same great experience. 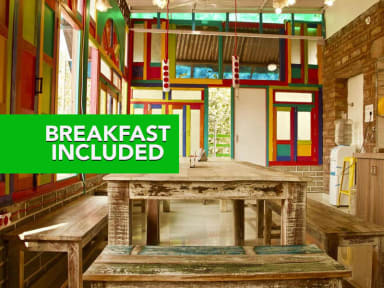 Super cool hostel, nice social common room indoors and out. Good breakfast and great rooftop restaurant. The guy on the front desk was so helpful in planning our activities, and always very cheerful. He really made the place ! Breakfast was good and the restaurant and top floor areas were lovely. Nice hostel, nice rooms and the roof was a nice place to hangout. The blue city tour was great and the staff were super helpful. Would highly recommend. Overall, it was a good place and had a great breakfast. I wasn’t given the room type that I had booked, but other than that everything was fine! we had a good stay at go stops in Jodhpur. Rooms were clean and staff were friendly. Food available on the rooftop is quite nice and pretty reasonable. Overall it was a good stay. Booked here after staying at gostops before. It not as good as the others. More limited breakfast nothing of interest in walking distance. Some of the staff are friendly and helpfull others are not. I had booked in the 8 bed dorm and was pressured to switch and did without being told the change would be a downgrade. No change in cost though. After being moved they later put someone else in the bed I took and just told me to move to the other bed. Does not deserve a 9+ rating at all.